← Lebedik Brings Their Yiddish Songs and Stories Back to Or Shalom! 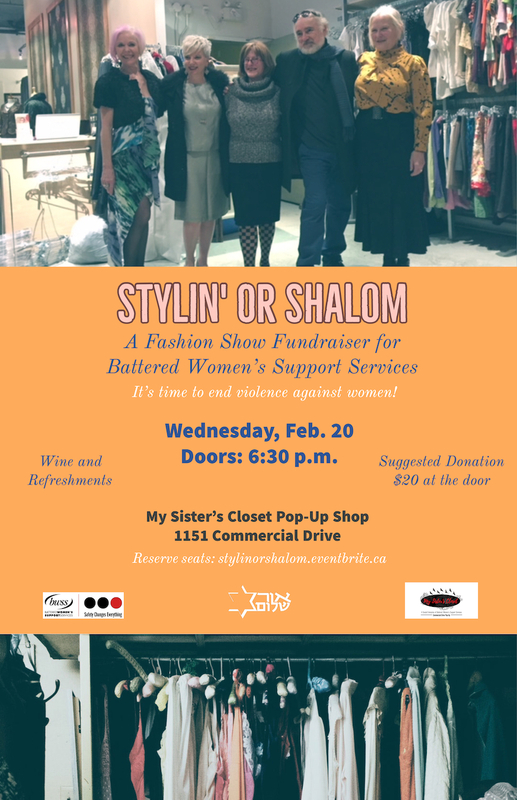 Stylin’ Or Shalom returns to raise funds for Battered Women’s Support Services (BWSS) and you’re all invited to come have a good time while supporting a Vancouver non-profit. Ten enthusiastic members of the Or Shalom community are going to be doing their little turns on the makeshift catwalk at the My Sister’s Closet Pop-Up Shop on Wednesday, Feb. 20. Join us for this empowering night and fun fashion show! In 2017, Or Shalom held its first fundraiser for BWSS. We raised over $1,000 in one evening through entry donations to the fashion show as well as through shopping the great selection of womenswear and menswear available at My Sister’s Closet. We have a fantastic program this year – your donation includes wine and refreshments and you’ll hear from the people at BWSS themselves about the impact their work has had on the people that they support. Battered Women’s Support Services (BWSS) provides education, advocacy, and support services to assist all women in its aim to work towards the elimination of violence and to work from a feminist perspective that promotes equality for all women. According to BWSS, on average, a woman in Canada is killed by her intimate partner every week. One in every three women in British Columbia has experienced violence. Almost a million women are either assaulted or sexually assaulted in Canada each year. In Canada, one in every five women abused by a partner is assaulted during pregnancy. More than a million children in Canada have witnessed violence against their mother by their father or father figure. Doors open at 6:30 p.m. and the show starts at 7 p.m. The suggested donation is $20 at the door – limited seats are available so you’re encouraged to reserve yours in advance. Clothing donations will also be accepted. Bring some friends along to this great evening in East Van. This entry was posted in Upcoming Events and tagged Jewish Vancouver. Bookmark the permalink.